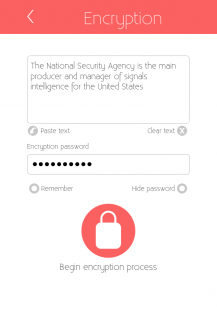 With the NSA firewall, you can encrypt and decrypt any text. 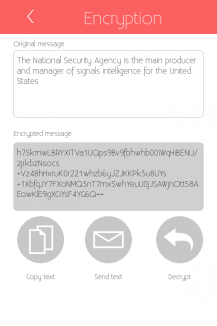 You can send these encrypted messages via text-message, WhatsApp for Facebook with no hassle. The recipient can only read the message, if he/she knows your secret password. If somebody should intercept the message, all he gets is gibberish. 1) Enter text, e.g. "This is a secret!" 2) Enter desired password, e.g. "Zahd&182"
3) The app decrypts your text with the password. 4) Send this message to your friend. If somebody intercepts the message, he won't be able to read it. Your friend can decrypt the message by entering the secret password "Zahd&182". Of course, the recipient must have the secret password, otherwise he won't be able to decrypt the message. You should always tell the password to the recipient in person, so it can't be intercepted. The secret password is NOT stored on our servers. 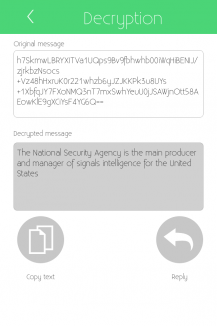 Encrypting messages before sending them makes it harder for espionage and other government agencies to read, than just sending them unencrypted. However, this app cannot guarantee 100% secure communications. Of course, this app can be used to send messages not everybody is supposed to read (e.g. your wife, your boyfriend or your mother). We use the 128 bit AES-Process to encode messages. What Wikipedia says about AES: "The Advanced Encryption Standard (AES) is a specification for the encryption of electronic data established by the U.S. National Institute of Standards and Technology (NIST) in 2001." Have fin with the app!